Certain eyelid and facial features are distinctive of an individual. Most people have subtle asymmetries of facial anatomy that render them unique. Measurements of these anatomical traits are used by ophthalmologists to document facial asymmetries and follow disease progression. While anatomical features can change some with advancing age and disease processes, attention to details of anatomy reveal the individual traits that make us look distinct. While no one measurement describes this variation amongst individuals, using many measurements allows a quantification of our anatomy that can vary with age and facial expression but holds true due to our individual anatomy. The measurements that follow were taken from the two daguerreotypes and compared using Photoshop program to allow magnification alignment and precision of the actual measurements. The following anatomic indices were measured and are given for the right (OD) and left eye (OS) of the 1847 and the 1859 images. While these measurements are limited by the image resolution, and variation in lighting as well as the technique of obtaining daguerreotypes, certain trends emerge from these comparisons that make a strong argument that the woman in the 1859 portrait is the same woman in the1847 daguerreotype known to be Emily Dickinson. The two women have the same eye opening size with the right eye opening being slightly larger than the left. The left lower lid in both women sits lower than the right lower lid. The right upper lid from the crease in the lid has more length than the left upper lid. Also, the left upper lid margin height sits lower that the right upper lid margin height (0.1 mm ptosis OS). Other similar facial features are evident between the women in the daguerreotypes. The right earlobe is higher on both women. The inferonasal corneal light reflex suggests corneal curvature similarity, allowing us to speculate about similar astigmatism in the two women. Both women have a central hair cowlick. Finally, both women have a more prominent left nasolabial fold. After a thorough examination of both of these women’s facial features as viewed from the 1847 and 1859 daguerreotypes, I believe strongly that these are the same people. 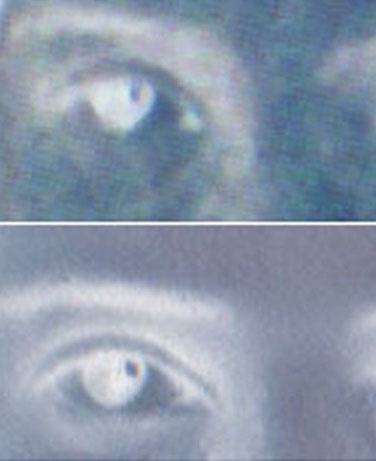 Below are xray-type images of Emily Dickinson's right eye in the 1847 daguerreotype and, below that, the right eye of the figure in 1859 daguerreotype, each of which shows an eye misshapen and flattish from 2 o'clock to 5 o'clock, and the tiny dot of ocular reflection in both is high and to the right. In these images one can see the astygmatism to which Dr. Pepin refers.